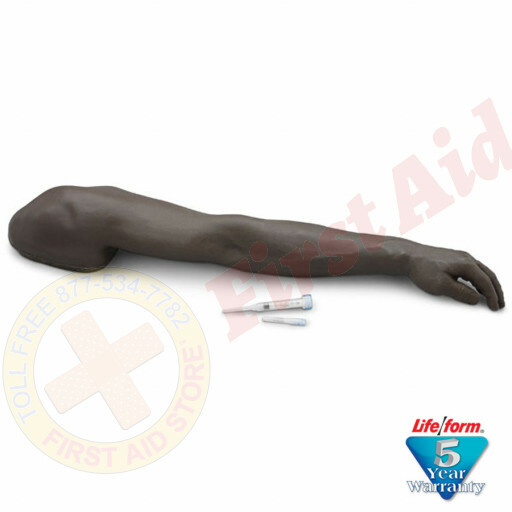 An economical IV demonstration arm constructed of soft material with lifelike veins in the skin surface that are visible and palpable. No internal tubing exists, but the skin can be punctured repeatedly. No blood to set up, no mess to clean up, and no leaking. May be used in venipuncture practice when fluid return is not essential, and is suitable for allied IV demonstrations and practice (flexion, cleaning, taping). Intramuscular injections can be practiced in the deltoid region. The skin and underlying foam may be cut for suturing practice. This lightweight practice arm provides a more lifelike feel than heavier models on the market, and makes it easier to transport for demonstrations. Inexpensive enough so that each student can have their own arm. NOTE: We recommend that no fluids be injected into this arm. One-year warranty. The Life/form® IV Demonstration Arm - Black.